Introduction: Incidental gallbladder carcinoma (IGBC) is a carcinoma first detected by the pathologist. The indication for the cholecystectomy was a benign disease. It is often supposed that the laparoscopic technique could deteriorate the prognosis of gallbladder cancer. 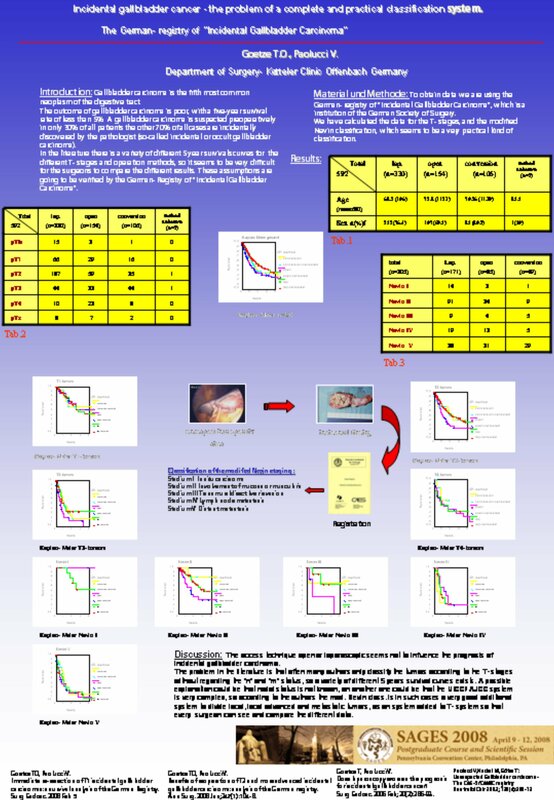 In the literature there is a big variety of different 5 year survival curves for the different T- stages and operation methods, so it seems to be very difficult for the surgeons to compare the different results. These assumptions are going to be verified by German- Registry of incidental gallbladder carcinoma. Material and method: To obtain data we are using the German- Registry, which is an institution of the German Society of Surgery. We have calculated the data for the T- stages, UICC/AJCC- stages and the modified Nevin- classification, which seems to be a very practical kind of classification. Results: 550 cases of incidental gallbladder cancer have been recorded so far. 307 patients were treated by the laparoscopic procedure, 145 by the open one and in 96 cases there was an intraoperative conversion from the laparoscopic to the open technique for non oncological reasons. After analyzing the T- stages the Kaplan- Meier graphs show a significant advantage for the laparoscopic procedure compared with the open surgery for the entire patients (n=550) (p< 0,05). According to the T- stages calculated with the Kaplan Meier method the laparoscopy seems not to worsen the prognosis. In 285 cases it was possible to make a complete staging, regarding the N and M- status. After analyzing the UICC/ AJCC- stages and the Nevin stages for 285 there also seems to be no disadvantage for the laparoscopic treated patients. Discussion: The access technique open or laparoscopic does not seem to influence the prognosis of incidental gallbladder carcinoma. The problem in the literature is, that often many authors only classify the tumors according to the T- stages without regarding the “n” and “m” status, so a variety of different 5 year survival curves exists. A possible explanation could be that nodal status is not known, or that the UICC/ AJCC- system is very complex and difficult, so according to the authors the mod. Nevin classification is in such cases a very good additional system to divide local, local advanced and metastatic tumors, as a system added to T- system so that every surgeon can compare the different data.